What is the Free Launch Bar? Free Launch Bar is the free replacement for the standard Quick Launch bar. 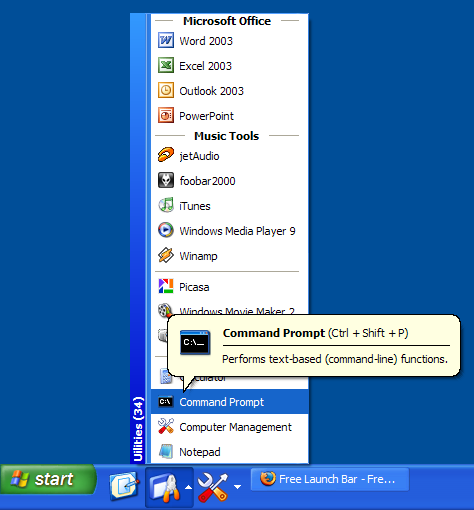 All functions presented in Quick Launch are also in Free Launch Bar. However, the Free Launch Bar is fully compatible with Quick Launch because it uses the same folder for shortcuts. But there is one huge difference. Free Launch Bar allows you to combine your shortcuts into groups. This feature looks like popup menus. This vastly improves the management of your shortcuts and save working space on your desktop. By using Free Launch Bar, you speed up the launching of your applications like never before. Why you need the Free Launch Bar? If you want to extend your Free Launch Bar with Plugins, Virtual Folders, Skins etc. you can try our other software True Launch Bar. Free Launch Bar is compatible with True Launch Bar and True Launch Bar will use all settings from your Free Launch Bar. Free Launch Bar is the lite version of True Launch Bar. So all information about features of Free Launch Bar you can read on True Launch Bar website.